Austrian financier and philanthropist; born at Presburg 1792; died there Nov. 23, 1844. At first engaging in the silk trade, he later won fame and wealth in the cotton business; and he established in Marienthal, near Vienna, one of the first cotton-mills worked by machinery. In 1835 he bought the state domain of Legnaro near Padua, where he established a cotton-mill which became one of the most important of its kind in Europe. Todesco's main activity, however, lay in philanthropy. At an expense of 25,000 gulden he established a primary and infant school in his native town in 1843, and its inaugural ceremonies, on May 7 of the following year, were attended by the archduchess Maria Dorothea. 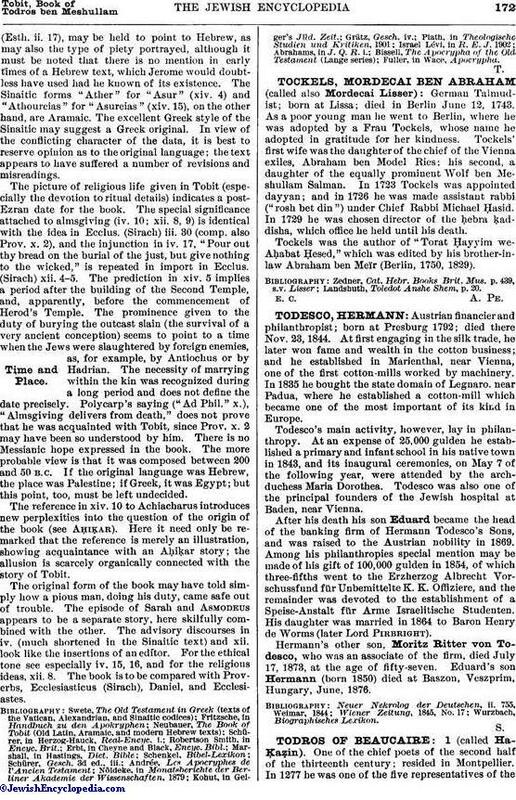 Todesco was also one of the principal founders of the Jewish hospital at Baden, near Vienna. After his death his son Eduard became the head of the banking firm of Hermann Todesco's Sons, and was raised to the Austrian nobility in 1869. Among his philanthropies special mention may be made of his gift of 100,000 gulden in 1854, of which three-fifths went to the Erzherzog Albrecht Vorschussfund für Unbemittelte K. K. Offiziere, and the remainder was devoted to the establishment of a Speise-Anstalt für Arme Israelitische Studenten. His daughter was married in 1864 to Baron Henry de Worms (later Lord Pirbright). Hermann's other son, Moritz Ritter von Todesco, who was an associate of the firm, died July 17, 1873, at the age of fifty-seven. Eduard's son Hermann (born 1850) died at Baszon, Veszprim, Hungary, June, 1876.